, one of the most celebrated mathematicians among the ancients, flourished about 250 years before Christ, being about 50 years later than Euclid. He was born at Syracuse in Sicily, and was related to Hiero, who was then king of that city. The mathematical genius of Archimedes placed him with such distinguished excellence in the view of the world, as rendered him both the honour of his own age, and the admiration of posterity. He was indeed the prince of the ancient mathematicians, being to them what Newton is to the moderns, to whom in his genius and character he bears a very near resemblance. He was frequently lost in a kind of reverie, so as to appear hardly sensible; he would study for days and nights together, neglecting his food; and Plutarch tells us that he used to be carried to the baths by force. Many particulars of his lire, and works, mathematical and mechanical, are recorded by several of the ancients, as Polybius, Livy, Plutarch, Pappus, &c. He was equally skilled in all the sciences, astronomy, geometry, mechanics, hydrostatics, optics, &c. in all of which he excelled, and made many and great inventions. Among others, he made a sphere of glass, of a most surprizing contrivance and workmanship, exhibiting the motions of the heavenly bodies. Claudian wrote an epigram on this invention. He fell upon a curious method of discovering the deceit, which had been practised by a workman, employed by king Hiero to make him a golden crown. Hiero, having a mind to make an oilering to the gods of a golden crown, agreed for one of great value, and weighed out the gold to the maker, who brought one home the full weight; but it was afterwards discovered, that a quantity of the gold was embezzled, and supplied with a like weight of silver. Hiero, being angry at this imposition, desired Archimedes to take it into consideration, by what method such a fraud might be discovered for the future. Whilst he was engaged in the solution of this difficulty, he happened to go into the bath; where observing, that a quantity of water overflowed, equal to the bulk of his body, it immediately occurred to him, that Hiero’s question might be answered by a like method, on which he leaped out, and ran homeward, crying, εὕρηκα! εὕρηκα! He then made two masses, each of equal weight with the crown, one of gold and the other of silver: when he had done this, he filled a large vessel to the brim with water, and put the silver mass into it, upon which a quantity of water overflowed equal to the bulk of the mass; then taking the mass out, he filled up the vessel again, measuring the water exactly, which he put in: this shewed him what measure of water answered to a certain quantity of silver. Then he tried the gold in like manner, and found that it caused a less quantity of water to overflow, the gold being less in bulk than the silver, though of the same weight. 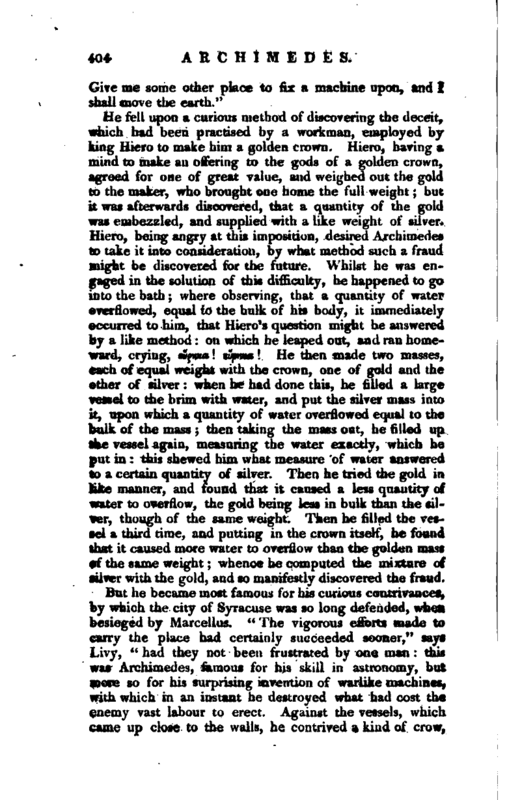 Then he filled the vessel a third time, and putting in the crown itself, he found that it caused more water to overflow than the golden mass of the same weight; whence he computed the mixture of silver with the gold, and so manifestly discovered the fraud. But he became most famous for his curious contrivances, by which the city of Syracuse was so long defended, when besieged by Marcellus. “The vigorous efforts made to carry the place had certainly succeeded sooner,” says Livy, “had they not been frustrated by one man this was Archimedes, famous for his skill in astronomy, but more so for his surprising invention of warlike machines, with which in an instant he destroyed what had cost the enemy vast labour to erect. Against the vessels, which came up close to the walls, he contrived a kind of crow, | projected above the wall, with an iron grapple fastened to a strong chain. This was let down upon the prow of a ship, and by means of the weight of a heavy counterpoise of lead, raised up the prow, and set the vessel upright iipon her poop: then dropping it all of a sudden, as if it had taUen from the walls, it sunk so far into the sea, that it let in a great deal of water, even when it fell directly on its keel.” However, notwithstanding all his art, Syracuse was at length taken by Marcellus, who commanded his soldiers to have a particular regard to the safety of Archimedes; but this ingenious man was unfortunatejy slain by a soldier, who did not know him. “What gave Marcellus the greatest concern,” says Plutarch, “was the unhappy fate of Archimedes, who was at that time in his museum and his mind, as well as eyes, so fiyed and intent upon some geometrical figures, that he neither heard the noise and hurry of the Romans, nor perceived the city to be taken. In this depth of study and contemplation, a soldier came suddenly upon him, and commanded him to follow him to Marcellus; which he refusing to do, till he had finished his problem, the soldier, in a rage, drew his sword, and ran him through.” Others write, tb.at Archimedes, seeing a soldier coming with a drawn sword to kill him, entreated him to hold his hand one moment, that be might notdie with the regret of having left his problem unfinished; but that the soldier, without paying any regard, killed him immediately. Others again write, that as Archimedes was carrying some mathematical instruments in a box to Marcellus, as sun-dials, spheres, and angles, with which the eye might measure the magnitude of the sun’s body, some soldiers met him, and believing there was gold in it, slew him. 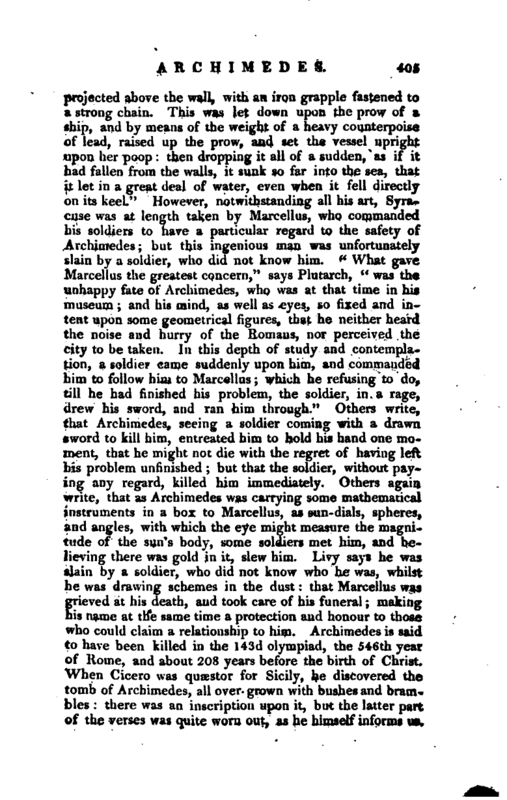 Livy says he was slain by a soldier, who did not know who he was, whilst he was drawing schemes in the dust: that Marcellus was grieved at his death, and took care of his funeral; making frs name at the same time a protection and honour to those who could claim a relationship to him. Archimedes is said to have been killed in the 143d olympiad, the 546th year of Homer, and about 208 years before the birth of Christ. When Cicero was quaestor for Sicily, he discovered the tomb of Archimedes, all over-grown with bushes and brambles: there was an inscription upon it, but the latter part of the verses was quite worn out, as he himself informs us. | Many of the works of this great man are still extant, though the greatest part of them is lost. His pieces which remain are, 1. Two books of the sphere and cylinder. 2. The dimension of a circle. 3. Of centres of gravity or aequiponderants. 4. Of spheroids and conoids. 5. Of spiral lines. 6. The quadrature of a parabola. 7. Of the commensuration of sand. 8. Of bodies that float on fluids. 9. Lemmata. 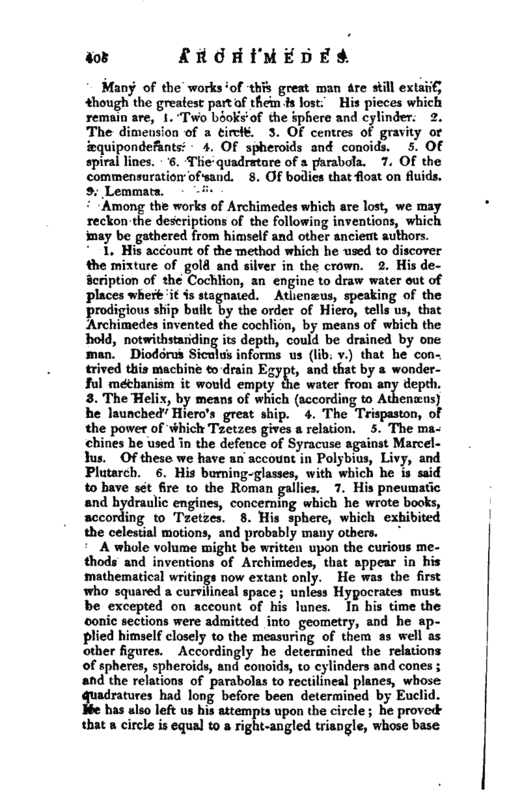 Among the works of Archimedes which are lost, we may reckon the descriptions of the following inventions, which may be gathered from himself and other ancient authors. 1. His account of the method which he used to discover the mixture of gold and silver in the crown. 2. H^s description of the Cochlion, an engine to draw water out of places where it is stagnated. Athenaeus, speaking of the prodigious ship built by the order of Hiero, tells us, that Archimedes invented the cochlion, by means of which the hold, notwithstanding its depth, could be drained by one man. Diodorus Siculus informs us (lib. v.) that he contrived this machine to drain Egypt, and that by a wonderful mechanism it would empty the water from any depth. 3. The Helix, by means of which (according to Athenaeus) he launched Hiero’s great ship. 4. The Trispaston, of the power of which Tzetzes gives a relation. 5. The machines he used in the defence of Syracuse against Marcellus. Of these we have an account in Polybius, Livy, and Plutarch. 6. His burning-glasses, with which he is said to have set fire to the Roman gallies. 7. His pneumatic and hydraulic engines, concerning which he wrote books, according to Tzetzes. 8. His sphere, which exhibited the celestial motions, and probably many others. A whole volume might be written upon the curious methods and inventions of Archimedes, that appear in his mathematical writings now extant only. He was the first who squared a curvilineal space; unless Hypocrates must be excepted on account of his lunes. In his time the conic sections were admitted into geometry, and he applied himself closely to the measuring of them as well as other figures. Accordingly he determined the relations of spheres, spheroids, and conoids, to cylinders and cones; and the relations of parabolas to rectilineal planes, whose quadratures had long before been determined by Euclid. He has also left us his attempts upon the circle; he proved that a circle is equal to a right-angled triangle, whose base | is equal. to the circumference, and its altitude equal to the radius; and consequently, that its area is equal to the rectangle of half the diameter and half the circumference; thus reducing the quadrature of the circle to the determination of the ratio between the diameter and circumference; which determination, however, has not yet been, done. But we must refer to Dr. Hutton for the farther improvements of this wonderful man. There have been various editions of the existing writings of Archimedes. 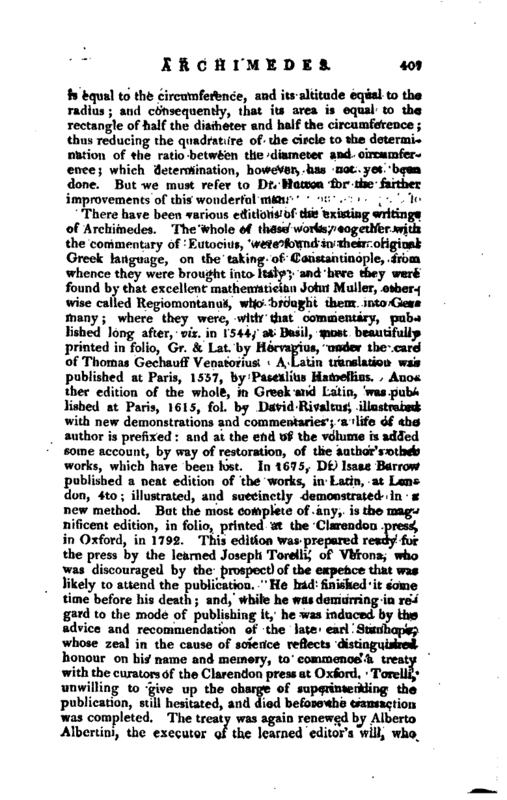 The whole of these works, together with the commentary of Eutocius, were found in their original Greek language, on the taking of Constantinople, from whence they were brought into Italy; and here they were foundry that excellent mathematician John Muller, otherwise called Regiomontanus, who brought them into Germany; where they were, with that commentary, published long after, viz. in 1544, at Basil, most beautifully printed in folio, Gr. & Lat. by Hervagius, under the care of Thomas Gechauff Venatorius. A Latin translation was published at Paris, 1557, by Pascalius Hamellius. Another edition of the whole, in Greek and Latin, was published at Paris, 1615, fol. by David Rivaltus, illustrated with new demonstrations and commentaries; a life of the author is prefixed: and at the end of the volume is added some account, by way of restoration, of the author’s other works, which have been lost. In 1675, Dr. Isaac Barrow published a neat edition of the works, in Latin, at London, 4to; illustrated, and succinctly demonstrated in a new method. But the most complete of any, is the magnificent edition, in folio, printed at the Clarendon press, in Oxford, in 1792. This edition was prepared ready for the press by the learned Joseph Torelli, of Verona, who was discouraged by the prospect of the expence that was likely to attend the publication. He had finished it some time before his death; and, while he was demurring in regard to the mode of publishing it, he was induced by the advice and recommendation of the late earl Stanhope, whose zeal in the cause of science reflects distinguished honour on his name and memory, to commence a treaty with the curators of the Clarendon press at Oxford. Torelli, unwilling to give up the charge of superintending the publication, still hesitated, and died before the transaction was completed. The treaty was again renewed by Alberto Albertini, the executor of the learned editor’s will, who | entrusted the work to the university of Oxford. Ah th papers which Torelli had prepared with a view to. this edition, Alhertini presented to the university, and transmitted, at the original cost, all the engravings of figures that were necessary for the completion of it. John Strange, esq. the British resident at Venice, was very active in conducting and terminating the business. 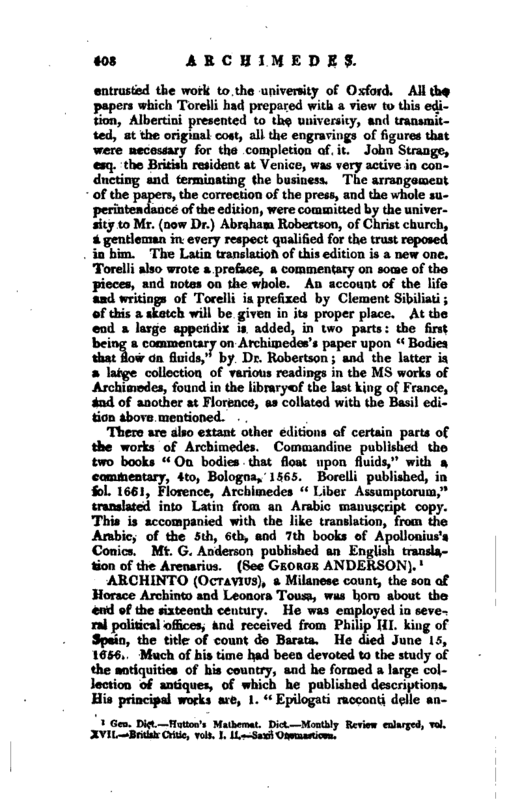 The arrangement of the papers, the correction of the press, and the whole superintewdance of the edition, were committed by the university to Mr. (now Dr.) Abraham Robertson, of Christ church, a gentleman in every respect qualified for the trust reposed in him. The Latin translation of this edition is a new one. Torelli also wrote a preface, a commentary on some of the pieces, and notes on the whole. An account of the life and writings of Torelli is prefixed by Clement Sibiliati; of this a sketch will be given in its proper place. 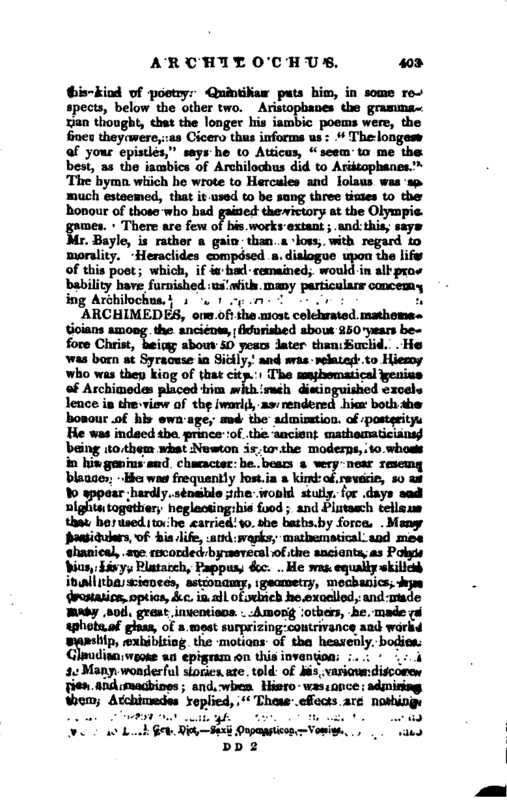 At the end a large appendix is added, in two parts: the first being a commentary on Archimedes’s paper upon “Bodies that flow on fluids,” by Dr. Robertson; and the latter is a large collection of various readings in the ms works of Archimedes, found in the library of the last king of France, and of another at Florence, as collated with the Basil edition above mentioned. Gen. Dict. —Hutton’s Mathemat. Dict. Monthly Review enlarged, vol. XVII. British Critic, vols. I. II.-—Saxii Onomasticon.